When I look at myself sideways in the mirror, I look pregnant. My stomach extends well beyond my chest, Sea accidentally elbows me on a daily basis, I’ve twice been offered seats on the bus. 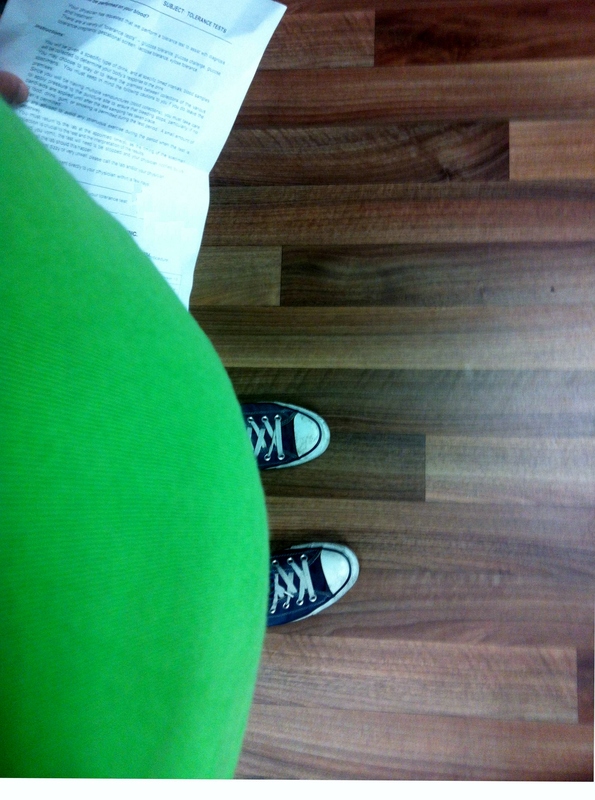 Still, more often than not, people don’t expect to see me pregnant– and so they don’t. Take, for instance, a conversation with an acquaintance earlier this morning. I hadn’t seen her in a couple of months, since before announcing Bingo’s impending arrival. After congratulating me and asking about parental leave, she asked: “So, how are you doing it?” “Sorry?” I responded, confused. Doing what, I wondered? Taking time off from work? It had been the last thing we had been talking about… “How are you doing it? Having a baby? Are you adopting?” “No,” I replied: “I’m 7 months pregnant.” This conversation, resulting in said flustered acquaintance offering repeated awkward congratulations before making a hasty exit, is one that has been repeated several times over the past months. Hearing that we’re going to become parents, the acquaintance or stranger will look from me, to Sea, back again, only to ask if we’re using a surrogate, adopting, etc. Then there’s the woman who cuts my hair. She’s been cutting my hair for years now, complaining bitterly about her husband and son, doting over her poodle, and always asking about “my girl”. A couple of months ago, I told her that Sea and I were having a baby. She immediately assumed that Sea was the one who was pregnant, asking how Sea was feeling, if her mother was going to come for the birth, and so on. I was too awkward to contradict this assumption, so instead gave half answers: Sea was feeling fine, her mother would not be coming for the birth. Since then, Sea and I have both been avoiding getting our hair cut. Sea’s hair is considerably longer than mine, so avoidance is a strategy that could feasibly work until after November. My shortly cropped hair, however, quickly goes from schoolboy to shaggy dog. Today, when the acquaintance asking about adoption made her hasty exit, I realized it was time. I crossed the street to the hair salon, and resigned myself to an awkward conversation as the woman cutting my hair realized that I was the one pregnant. Except it didn’t happen. I continued to deflect her questions, desperately trying to move on to other topics of conversation, Bingo kicking as the razor buzzed against my neck. As I waited for the appointment to end, I wondered how hard it would be to cut my own hair and just how bad it would be if I don’t get another haircut until December. Last Tuesday I went to visit Diet Coke, the midwife. It had only been three weeks since our visit with the other midwife, Herbal Tea, but I had inconveniently planned two weeks of travel that overlapped with the next scheduled visit. I walked into the clinic 20 minutes early, still trying to make amends for the visit when we had shown up horribly, terribly late and soaking wet. When DC appeared at exactly the scheduled appointment time, she greeted me with an abrupt, “Did you have something to drink?” Outside of my ability to pee on command, DC had never shown any interest in my hydration levels prior to this moment. I took my familiar perch on the burgundy bedspread in her office, as DC pulled out the exact paperwork on Rhogam that HT had taken us through during our last visit. I explained my déjà vu, meeting with obvious scepticism from DC. Defensively, I tried to scrape together the information from the last appointment. “I did! Blood product! Donated by women in a remote rural community!” DC’s scepticism shifted to annoyance at HT’s poor record keeping skills. As she furiously made notes in my file, she could be heard muttering: “HT is a lovely person, but…” She didn’t finish her sentence. After quickly listening to Bingo’s heartbeat (still going strong at 140-something beats per minute), DC sent me on my way with a revised appointment for the glucose test: two days later. I am apparently just full of risk factors: age (30! ), weight, and family history (thanks, mom). So Thursday morning found me up early, eating eggs for breakfast and drinking a lot of water. 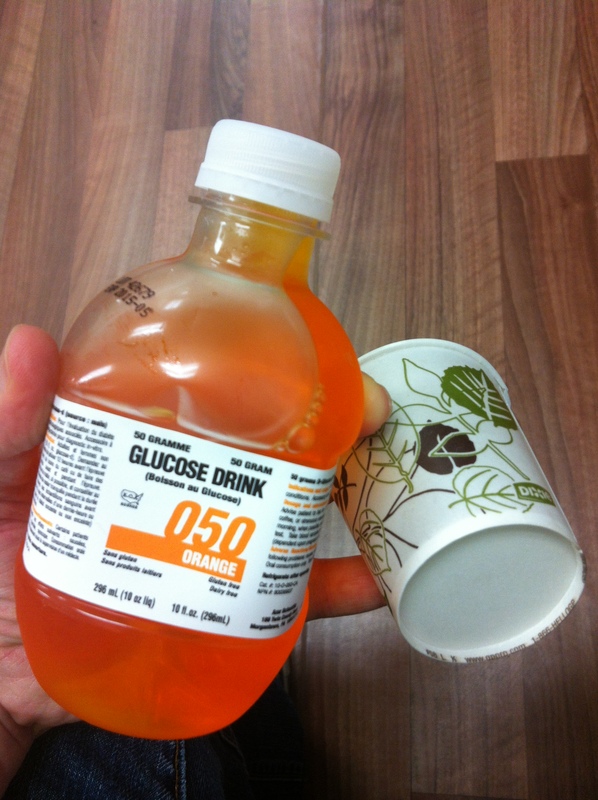 DC had told me that these “tricks” would make passing the glucose test more likely. I’ve always been an overachiever, and this test was one that I particularly didn’t want to fail, so I was willing to try any tricks suggested. Two hours later I walked into yet another unfamiliar clinic for the test itself, where a bored receptionist handed me a bottle of bright orange liquid and a paper cup and told me to finish the drink within five minutes. I had heard a lot about this painfully sweet drink, and steeled myself to chug it down. Though the sweetness burned my throat, it wasn’t as awful as I had imagined. I had pictured something more… syrupy than this watery liquid that tasted exactly like a more heavily sweetened version of the bright, artificial orange punch that McDonald’s served about 25 years ago. Finished, I was told to leave and come back in exactly an hour. I went to run errands nearby, simultaneously trying to remember my grocery list and figure out whether I was imagining the beginnings of a headache. 20 minutes into this hour long exile from the clinic, Bingo realized that somebody had drastically altered his/her diet, and that glucose was fun. I watched my stomach jump under my shirt and, now certain of the headache, appreciated that at least one of us was enjoying this experience. I hoped that the headache wasn’t a sign that I was failing the test. After an hour of running errands nearby, I returned to the clinic. Its popularity had increased in the hour I had been away. The seats were crowded, a group of children stood against the wall, and another bored receptionist futilely instructed a belligerent patient to sit down. Bingo and I were left to stand uncomfortably in the centre of the room until the bored receptionist, done with the belligerent patient, ushered me into a small room. The blood draw technician appeared at 10:57. Taking my paperwork, she frowned. Technician: It says here that you were supposed to return at 10:58! But maybe it was just the glucose. Let me begin this post by offending half of the people who read my blog: I hate gender reveal parties.